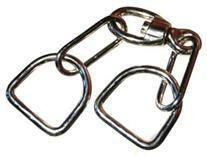 These are free roller buckles. This means that little roller you see actually rolls. Available in three sizes from 5/8" to 1", these are ideal for lighter weight fabric and leather applications when a true roller buckle is preferred, but not the heavier style of our heavy duty free roller buckles . 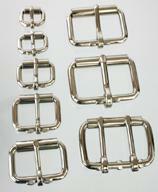 Center bar buckles. Widely used in the garment trade, they also have quite a few uses in leather work as well. 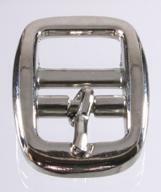 As the bar is in the center of the buckle, no additional keeper is required. 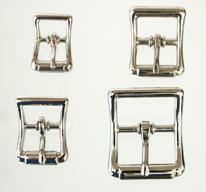 Available in 1/2" or 5/8", these are light weight buckles for fabric or very light leather. . 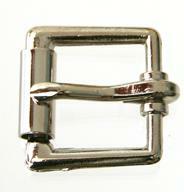 These roller buckles are designed to accept a small padlock through the tongue of the buckle, thereby making it impossible to remove whatever strap it is on. 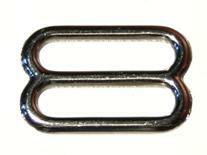 Unique 1/2" buckles with a center bar to avoid punching for the tongue, and allow the toung to pass easily through the buckle. Shiny black one inch roller buckle, D ring and deluxe keeper. Available separately or in a combo pack. A workhorse of the leather trade. These are used in literally thousands of applications. Big, heavy, and amazingly sturdy. While the heavy weight D rings are the mainstay of the leather trade, these lighter weight D rings are ideal for very light leather, or for fabric and macrame. 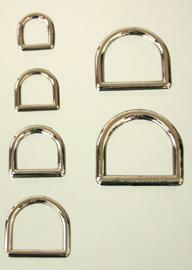 These are also available in smaller sizes than the heavy D rings. 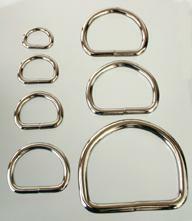 Solid (seamless) cast D rings in smaller sizes. Like the Heavy D rings above, but in a brass plated finish. Available in two sizes, 1" and 1 1/2", and either nickel or stainless steel, these are the perfect guide for leather or nylon strap, or tow straps. Rivet in place to hold a ring or other item for decorative or ulility purposes. 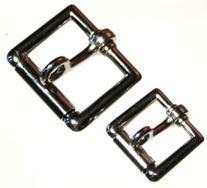 Available in 3/4" and 1" retainer sections in both nickel and gloss black. 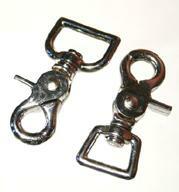 These are suitable for casual suspenders, attachment points for purses, even for key rings (attach to a belt loop). These are usually used in place of a standard welded D ring when there is a desire for a more flexible point of attachment. Use on leashes, leads, and any other application where the leather stays in place, but the clip needs to be able to come off. 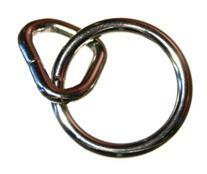 These O rings have a myriad of uses, in leather, fashion, and industrial trades. These are used in many many applications. Our most common use is as a "belt keeper", or the loop through which the tongue of a belt is placed. 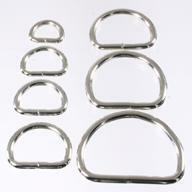 These are horse hobbles, suitable for use with many leather projects. This item is currently unavailable from our manufacturer. Our back order policy is as follows: If an item on your order is back ordered (not a frequent occurrence), we will email you and let you know when it is expected. You may choose to wait until your order is complete, or have us ship in two shipments. If you elect to ship in two shipments, the actual freight charges will be added to both shipments. Except if the delay will be more than three business days, we will ship in two shipments at our expense.